A volume becoming too-full or going missing can lead to data loss and downtime. Watchman Monitoring allows you to mark key volumes for monitoring using the PreferencePane. Use the PreferencePane to configure notifications when a volume is missing, or too full. Get notified when a volume is missing. Adjust the time allowed before a notification is sent, from 1 to 59 minutes. Adjust the threshold at which a notification is sent from 1 to 99 percent. Regarding drives going offline, allowing for 0 minute (immediate) notification resulted in false positives. Unlike other notices, Watchman Monitoring does not check this only on the agent's hourly run. We ship a background process called diskjournald to track which volumes are mounted, and when. Monitoring Time Machine destinations for capacity is not recommended, as they can continue to serve their purpose even when 95% full. 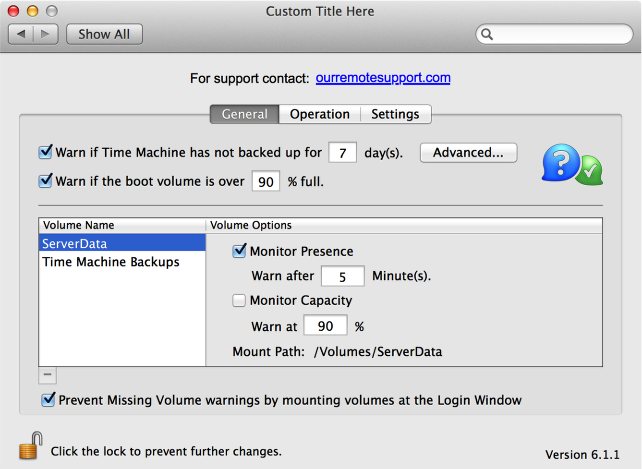 If backups can not complete in a given time frame, the Time Machine plugin will alert if backups cannot complete. When a locally connected volume is monitored for Presence, but there is no logged in user, notifications may be sent that the volume cannot be found. Prevent this by selecting the checkbox "Prevent Missing Volumes warning by mounting volumes at the Login Window". On computers running Mac OS X Server, or Server.app, this checkbox will show as checked by default, as this reflects the state of the computer's configuration.